Ralphs is a Los Angeles based super market chain with stores located throughout Southern California. Normally, I don't take photos of grocery bags, but this being Los Angeles, the bags my wife brought home caught my attention. In other parts of the country, you might see a grocery bag wishing you Happy Easter. In Los Angeles, at least on the westside, our local grocery store was wishing everyone - both Jews and Gentiles - Happy Passover. Interesting that there was no Jewish equivalent to the Easter Bunny as part of this Passover Greeting. A Passover Seder, complete with the Star of David, was part of the design. 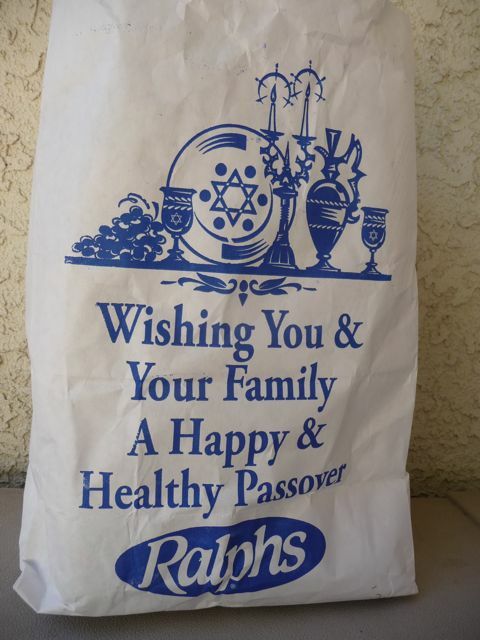 In a world where most holidays are dumbed down for fear of somehow "offending" someone, Ralphs choose a design that both respected the holiday - and those who celebrated it. Passover celebrates the Jews freedom from slavery in Egypt during the time of Moses. A lamb was sacrificed so that God's judgement on Egypt would "pass over" the Jews. As a Christian, especially during Easter, I'm reminded that Jesus was publicly introduced as "the lamb of God that takes away the sins of the world." Christians often forget that the Last Supper that Jesus celebrated with his disciples was a celebration of Passover meal - and a foreshadowing of his own death, burial, and resurrection. A bit ironic perhaps, but the Happy Passover shopping bag from Ralphs was a more significant reminder of the events of Good Friday and Resurrection Sunday than images of bunnies and eggs.